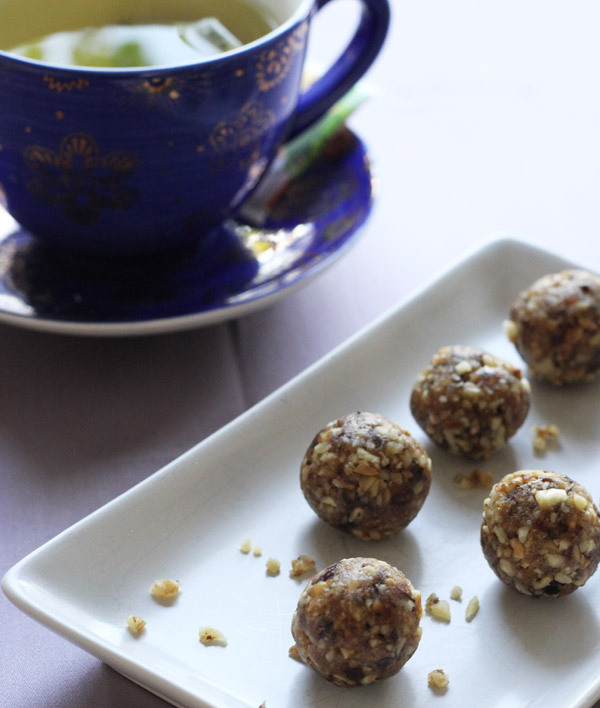 When you are in the mood for something sweet and crunchy, yet still healthy, try these delicious walnut bites. I recommend to have them with tea, in a comfy sofa with your favourite slippers on while enjoying a good book. Add pitted dates, walnuts, coconut oil and salt to a food processor. Process quickly for no more then 2-3 minutes. The mixture should be cource and the walnuts just coarsely chopped. The dough should not stick together, however the ingredients should be evenly blended. Make balls, by rolling the dough in the palm of your hands. Place in a jar, with airtight lid and store in the fridge until devoured. Add spices such as cinnamon, or make a chocolate verion by adding raw cacao powder.